Many adults remember as children wanting to go to a funeral and not being allowed. Adults admit to having to deal with anger or rejection and their grief process becomes delayed. Despite this a recent British Social Attitudes survey showed that almost half of people (48%) still think it’s inappropriate for children under 12 to attend funerals. It hasn’t always been this way. In years gone by, the whole cycle of life was played out at home. Babies were born there and families usually washed and cared for their dead at home. The whole family would file into the room to pay their respects, including children, who also attended the funeral. Children take things literally, , so avoid using expressions such as “lost your mum” or “Auntie’s gone on a journey”. Explain the purpose of the funeral – that it’s a special ceremony where everyone thinks about how much they cared for someone and says goodbye – and, crucially, what it will be like there. Have an opt-out plan. Choose someone who can take them out if they get bored or can’t handle being there. If they decide not to go, there are alternative ways for them to say goodbye – scattering the ashes or releasing a balloon with a message, for instance. Children should be taken along to funerals. Adults forget that children also need to process death. If the adults present do it authentically they can speak into a child’s world so that they understand and appreciate what’s going on. Consider modern phraseology when death is being mentioned. For example it’s becoming increasingly common for people to talk of ‘passing’ instead of death. Where do they think the deceased has passed to? Clear explanation needs to be given. ‘Passing’ could be explained as someone passing on to an eternal life, passing from one form of life to another. I love it when children go to funerals. They offer something adults can’t. And it’s not just whether you take kids to funerals or not, it’s whether you let them connect with those who are elderly and in hospital. Working in an Older Persons’ Hospital one of the things I often hear from patients is how upset they are that their grandchildren are not allowed to visit them because they might get upset! The patients don’t believe it, but their own children do! One rest home resident asked her family why the grandkids weren’t visiting. Protecting them from death? Reply? No, old age. We want our children to remember you as you were, not as you are now.” Her response? “I was old when I came in here. I am still the same inside although some of my parts aren’t working as well.” She is a lively engaging woman who shares stories of her life with other children who come to the rest home- all the while waiting and hoping that her own beloved grandkids will come! Why do we try and sanitise life, choosing only the bits we want to show. Why is that we leave some of the best bits out, our real treasures. Children bring joy and warmth, for example when they come bearing a homemade card or painting for a still alive elderly person or to put on the coffin of a loved grandparent. There is something very special that happens in that moment. I have found it important during a funeral to speak specifically with children so that they connect with what is going on. Not to do so makes it into an adult affair with them as a mere observer. I have had so many positive comments as a result of my focusing on and including the children. It’s very sad when we exclude children from death. We have so much to learn really! Why on earth would children NOT go to funerals? At the church they see people giving thanks for the person who has gone and hope for the future. For the bereaved they bring joy in the middle of tears. It’s part of life. People die but people also go on living. It’s a time when we pass on the faith simply by the way we respond to death. We also give them a language and ritual for dealing with death. At the funeral of our 5 year old granddaughter many of our friends brought their children and grandchildren. They played happily and quietly together. The children needed their friends there. They were provided for by a child friendly play area after the service. For adults it reminds them that life goes on. Older children can be curious about what is happening to the body etc. Some plain facts are often helpful!!! I’ve noticed that over the years there is a blending of European, Maori and Polynesian customs. 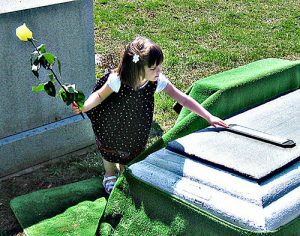 Funerals can be a time of family gatherings and reunion, when children get to know their cousins who they seldom see, along with old family friends. They hear the stories and the traditions are passed on. I have always encouraged families to bring the whole whanau to the funeral and wider proceedings. There is something affirming about having new life there in the presence of the old passing away. In our own situation (with the known impending death of grandma), the grandchildren have been present all along the way – in hospital, hospice and home – so why would we exclude them from the most solemn parting of all? Some try to sanitise death by talking only about the “celebration of a life” –omitting to state the fact that the reason the family and friends have gathered is because their loved one is dead! As a grandfather I’ve been talking about my funeral for a decade with our mokos (grandchildren). They are aware of their roles, expectations and our grief process when honouring and farewelling the deceased. They have experienced Samoan funerals, Maori Tangi and English Funerals. Our children have their own spin on and understanding of their faith and cultural practices of farewell and honouring. The mokos know they will help their parents with this farewell and honouring. Speaking about it now to the extended Aiga safe guards this process and attempts to cut down disagreements and arguments between the various clans. A family preparing for grandma’s funeral asked if I could baptise her great grandchild at home where the deceased woman was lying in her coffin. On the day before the funeral 30 to 40 people including a dozen children crammed into a small living room, many of the kids leaning against the coffin as we baptised the baby. Expressing new life, faith commitment and the joy of a life waiting to be lived, as we grieved for a wonderful Christian who had lived well, seemed entirely appropriate. It was an experience I will never forget and made the funeral the following day a much more meaningful and life giving experience.